San Francisco voters approved a tax on the city's wealthiest companies Tuesday in an attempt to alleviate homelessness in a place where residents at risk of being priced out routinely encounter people sleeping on the streets. Despite opposition from the mayor and some business leaders, about 60 percent of voters supported Proposition C, but it was falling short of a two-thirds majority that would ward off litigation. Critics say it's a "special tax" dedicated to specific needs and so under state law requires more than the simple majority required for a general tax. Threat of legal action didn't dampen the joy of proponents, including billionaire Marc Benioff, whose financial support upended the dynamics of the campaign and ticked off other prominent tech leaders. Benioff, whose cloud-computing company Salesforce is the largest private employer in the city, donated at least $8 million to the cause. He went against Mayor London Breed, who said the measure lacked accountability and consensus. He got into Twitter fights with Twitter and Square chief executive Jack Dorsey and Zynga chairman Mark Pincus over their responsibilities to San Francisco. Voters have passed Proposition C — a grassroots-led ballot measure that will tax San Francisco's largest companies — those making over $50 million per year — and earmark the money for housing and homelessness issues, including behavioral health services. Pete Suratos reports. "Prop C's victory means the homeless will have a home & the help they truly need! Let the city come together in Love for those who need it most!" Benioff tweeted Tuesday night. No on C spokesman Jess Montejano chastised proponents of the measure for failing "to earn the two-thirds voter support necessary for San Francisco to ever see a penny that Proposition C promised." San Francisco's outcome was the opposite of what occurred earlier this year in Seattle, where city leaders repealed a proposal to tax business for homelessness services after pushback from Starbucks and Amazon. The City Council of Cupertino in Silicon Valley scuttled a similar head tax proposal after opposition from its largest employer, Apple Inc.
A measure to raise $6 million a year from a per-employee tax passed easily Tuesday in Mountain View, another Silicon Valley city. The tax, most of which will be paid by Google, will go largely to ease congestion. Homelessness has become a driving issue along the West Coast as growing numbers of well-paying tech jobs and a history of under-building prices out middle-class and lower-income people from the tight housing market. A family of four in San Francisco earning $117,000 is considered low-income. 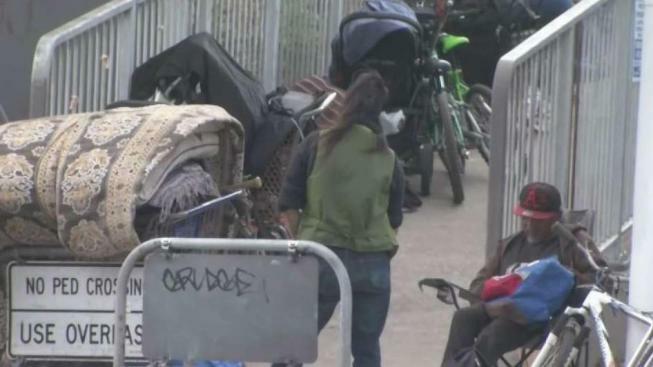 Some streets are so filthy from used syringes, encampment detritus and human waste that officials launched a special "poop patrol." Prop C would tax the city's wealthiest companies to fund services that could get homeless people off the streets. But not everyone thinks it's the right approach to the city's crisis. Proposition C would raise up to $300 million a year, nearly doubling the city's current annual $380 million spending to combat homelessness, from a total city budget of $10 billion. The measure would levy the tax mostly by revenue rather than by number of employees — an average half-percent tax increase on companies' revenue above $50 million each year. Benioff says Salesforce would pay an additional $10 million a year. "I think that Benioff's endorsement and his money helped immensely to get the message out, but beyond that, the homelessness issue is something that San Franciscans see every day," said Jennifer Webber, a political consultant who was not involved in the contest. Even though Breed's position lost, "she will be the beneficiary of the funding that is coming from the measure," Webber said. As mayor, she also will be even more accountable for addressing homelessness in San Francisco if hundreds of millions of dollars in funding comes her way. Breed said in a statement Wednesday that she would work with both sides to deliver on the measure's goals and address any legal uncertainties. "The voters sent a clear message that they want an increase in funding to help meet this urgent challenge," she said. California's constitution calls for "special taxes" put on the ballot by elected officials to pass a two-thirds threshold, but courts have not ruled on whether that requirement applies to tax measures backed by citizen initiative. City Attorney Dennis Herrera said in a statement that his office will defend Proposition C if it is challenged in court since it was backed by a clear majority of voters. He is currently asking the Superior Court to verify that tax initiatives put on the ballot by voters need only a simple majority. The question is in reference to a parcel tax for teachers that San Francisco voters approved in June. A separate June measure that raised revenue taxes on commercial rents for childcare services is also pending in court because it did not meet the two-thirds threshold. San Francisco's treasurer plans to collect the new tax for the 2019 tax year, although the money will be held in a separate account until it can be spent, said city Controller Ben Rosenfield in a memo issued Wednesday.